An ﻿unbeatable package for the independent retailer, the PC Series scales from TOR REY offer everything you want in a retail price computing scale. With the perfect combination of a compact footprint and large weighing surface, the PC Series price computing scales are designed to meet the needs of your business. The PC Series Price Computing scale is a great tool for the sale of commodities in a variety of stores (including supermarkets, delis, grocery stores, carnecerias, convenience stores and more). Portable and sturdy, our scale features an AC adapter and built-in rechargeable battery with an auto power-off function to save power. 15 direct access keys allow you to recall the unit price with one touch and added functionality to retrieve pricing on up to 100 additional items. 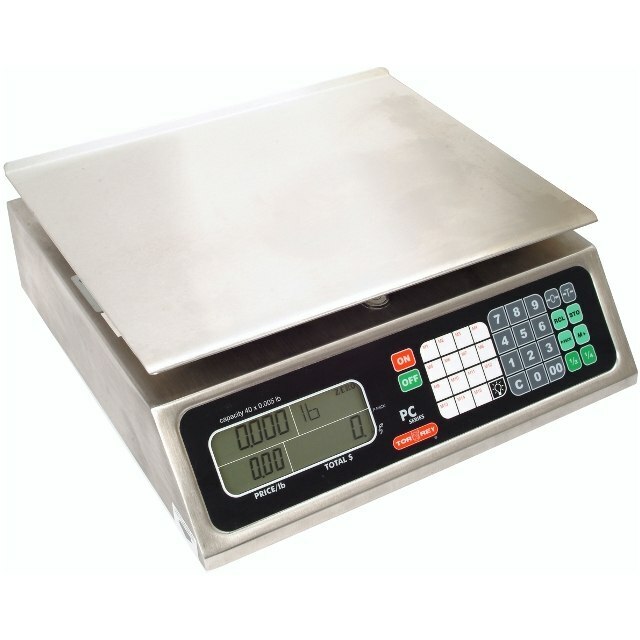 The PC-40L price computing scale offers a 40 lb (precise to .01 lbs) capacity, giving it the precision you need to help maximize your profits. A pre-pack function speeds up same product packing operations and the user friendly keypad and easy-to-read backlit display eliminate calculation errors and contributes to a positive customer service experience. Whether you're selling apples at a produce stand, pricing ground beef in a butcher shop, or weighing cheese in a dairy, the PC Series Price Computing scales will provide the reliability you demand. So if you need a dependable and functional scale at a very affordable price, choose the PC Series from TOR REY.